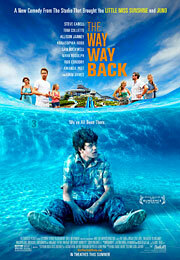 Much like “Little Miss Sunshine,” “The Way, Way Back” succeeds due to its winning script and talented cast. James holds his own alongside some really great actors as the perpetually awkward wallflower (he tells you all you need to know about Duncan from his defeated body language), while Carell plays against type once again in a role that, although somewhat one-dimensional, proves that he may be a stronger dramatic actor than a comedian. However, it’s Rockwell who completely owns the movie as the fast-talking king of the water park. Channeling Bill Murray from “Meatballs,” Owen is the kind of guy that everyone wants to be around, and it’s easy to see why thanks to Rockwell’s immensely charming and hilarious performance. The rest of the ensemble isn’t given quite as much to do (Allison Janney has some funny scenes as the boozy neighbor, and writers/directors Nat Faxon and Jim Rash earn some laughs in smaller roles), but they provide excellent support nonetheless. Many of the characters are imbued with a vulnerability that gives them a lived-in quality, and that’s where having good actors in seemingly throwaway roles is really important. It helps that Faxon and Rash (who won an Oscar for penning the 2011 tragicomedy “The Descendants”) have written a script that’s as smart, funny and sweet as it is incredibly heartbreaking at times, and it wouldn’t be surprising if they earned another nomination come awards time. “The Way, Way Back” is a solid directorial debut from the duo, but it’s not particularly showy, instead relying mostly on its fantastic screenplay and a career-best performance by Rockwell. The film also does a great job of breathing new life into the typical coming-of-age story, because although it follows an all-too-familiar journey, it feels like an entirely fresh experience.